…and I’ve had plenty to write about but not as much time (or energy!) to do it. 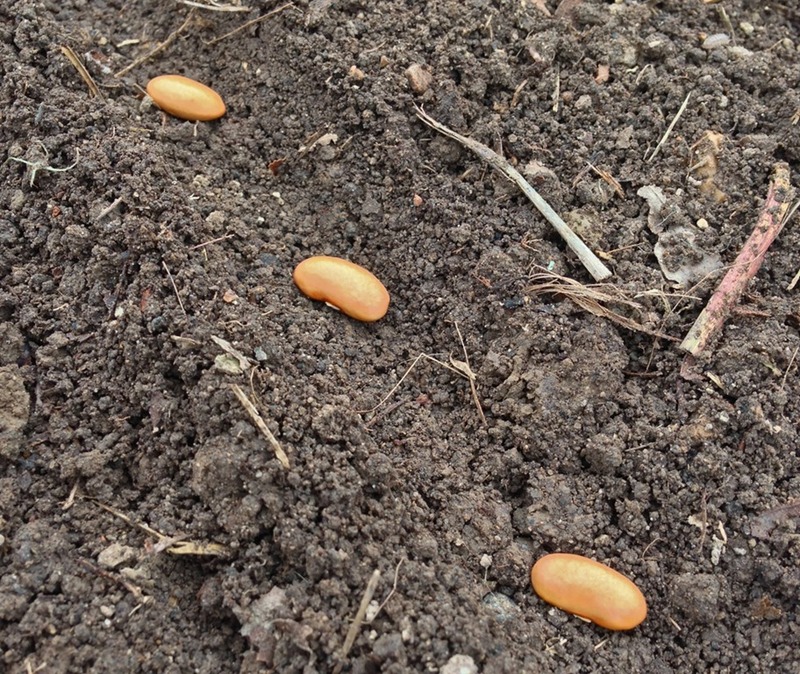 Yesterday and today I’ve been planting beans in the garden. Someone remarked they thought I was a little early but I’ve always planted now or even earlier and never had a problem with the beans not growing. One of the plantings I did was a “rescue” of some Ireland Creek Annie beans I grew a few years ago. Or, I should say, I tried to grow. 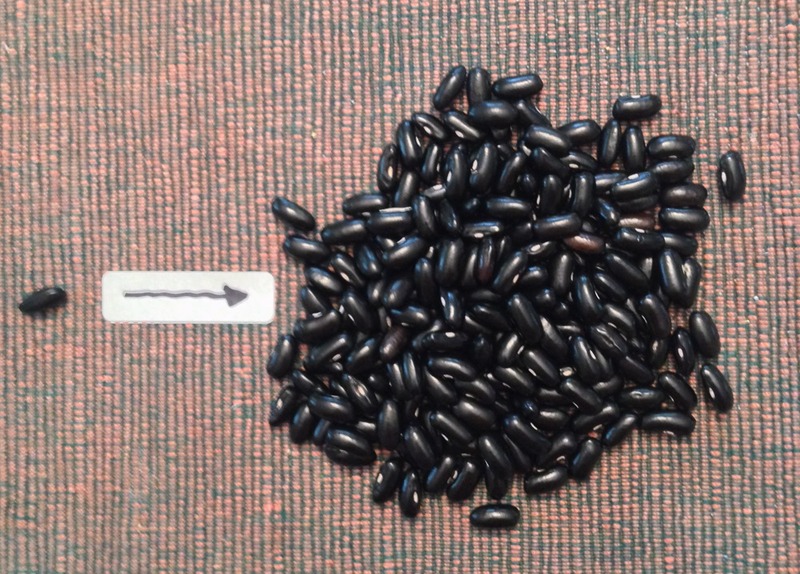 It was a terrible year for Mexican bean beetles and I ended up with literally only a couple dozen beans from my entire crop of this variety and the others didn’t fare much better. Today I planted them all out in the hope of increasing my supply. I’m pretty confident that if the beetles don’t get them this year I’ll have plenty again. You see, I speak from experience. Above is the pile of beans I grew from a single seed of Cherokee Trail of Tears that we obtained. (Sorry it’s so blurry. I haven’t gotten any better at photography during my hiatus.) I’ve planted a few dozen of these this year on poles and expect a good amount from this heirloom pole variety. We had some for dinner last night and they were pretty good. For the sauce I used sorghum syrup instead of molasses. I’ve made baked beans with molasses before and just didn’t care for the flavor. 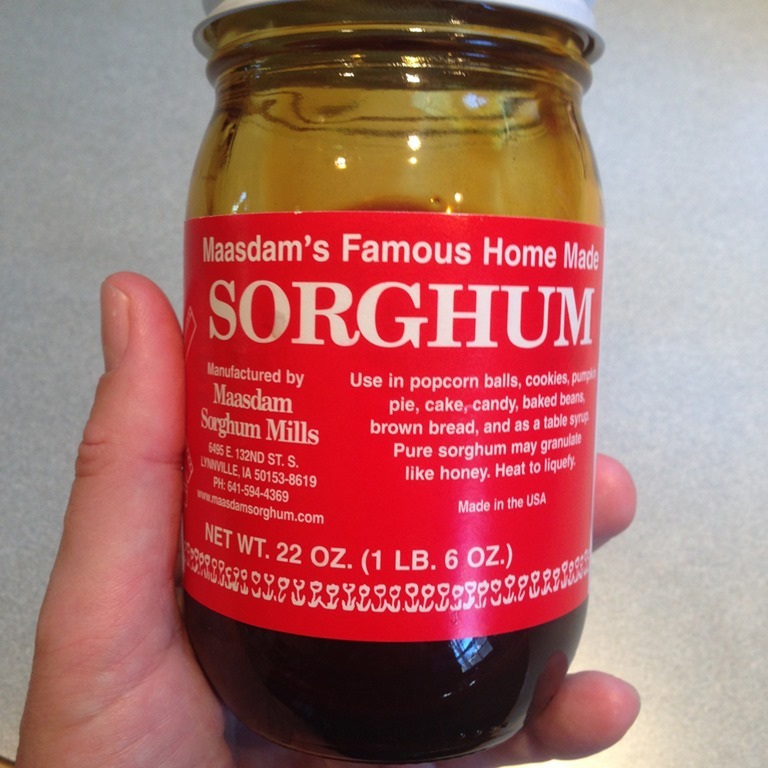 The sorghum ended up tasting much better. 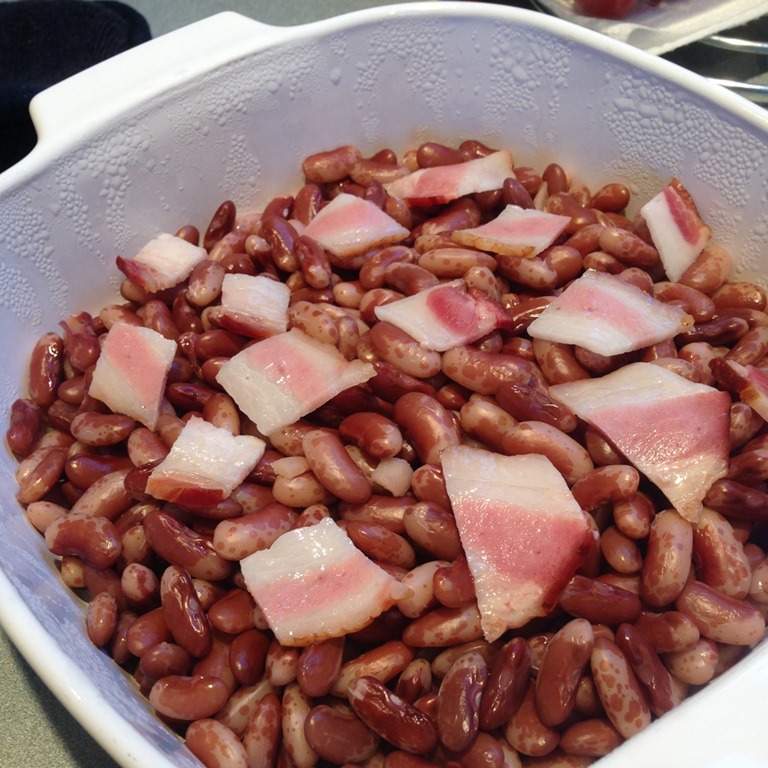 Throw in some bacon with the beans, add the sauce and bake. Both batches ended up needing much less time than anticipated to cook. I’ve found this is the case with home-grown beans. Must be because they are so fresh. 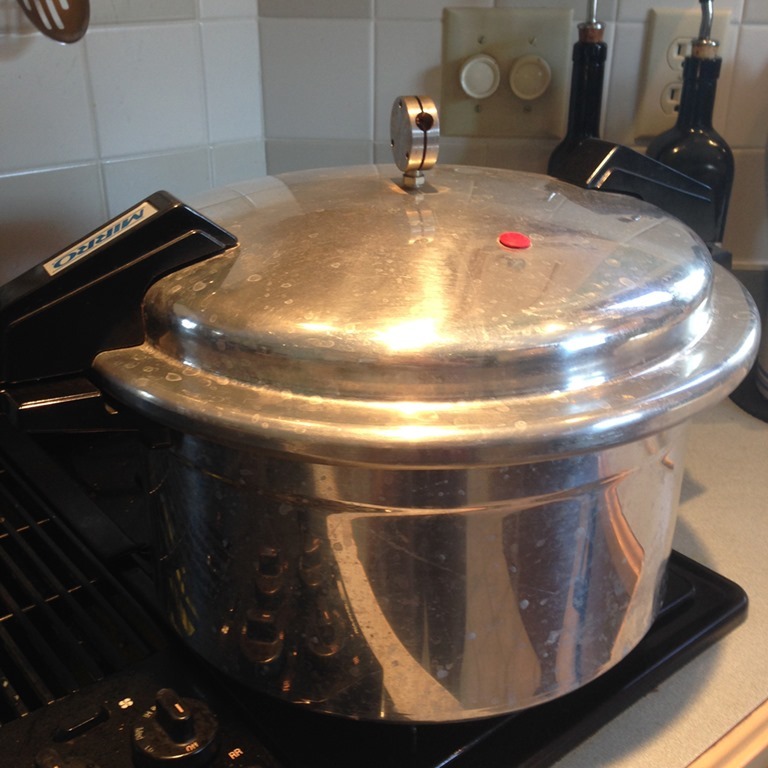 Here’s the pressure canner I got through Craigslist. I only had to replace the gasket and it was as good as new. Voila! Baked beans. I thought the sauce was a bit watery when they went in the oven and then into the jars but after canning it thickened up to a nice creaminess. We go through quite a few cans of baked beans in a year. 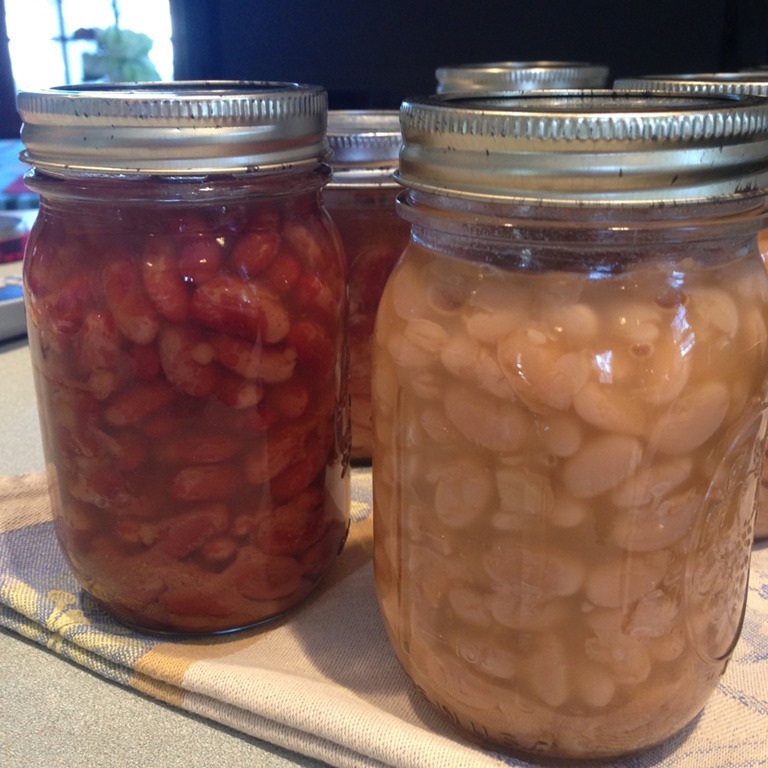 But I’m thinking now between my mad gardening skills and a functioning pressure canner we won’t be buying cases at Costco, much as we love beans! 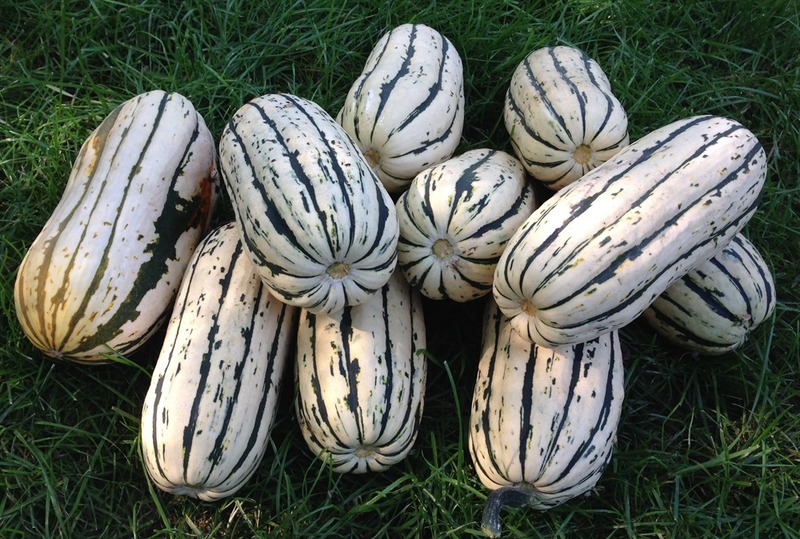 A few days ago I picked all of my Bush Delicata squash. They seemed ripe enough and the vine was starting to look a little ragged. It actually did vine more than I expected so I’m wondering if it was true to type. The two I grew last year stayed in compact mounds. Those two plants produced seven squash between them, this year’s single, viney plant made ten. I’m looking forward to having them in soups and curries, stuffing ravioli with them, making enchiladas (no kidding!) and mashing them up to go alongside roasted beasts and fowls. Delicata isn’t my favorite squash. Red Kuri probably holds that honor, or perhaps Buttercup. I grow the Bush Delicata because of my space limitations. Some day I’ll have plenty of room to try all sorts of squashes in my garden. For now I’ll just be picking up different varieties at the Farmers Market to sample. Something about harvesting the squash brought home the feeling that the garden season is really coming to an end. I know that I may have another good month of growing time, but my fall planting of peas, broccoli and a variety of lettuces have all failed already and I doubt there’s enough time to start over. Some spinach is coming up slowly. I may winter some of that over as a spring crop. The arugula is the only thing I planted this fall that is actually doing well. It’ll be delicious tossed on pizza hot out of the oven. What I think of as the “high summer crops” are as good as done. The paste and globe tomatoes were ushered out a little early by some wet weather that gave Septoria an edge. The two cherry varieties don’t seem to be as susceptible. I may throw some more of those in the dehydrator. More on that some other time. The rest were all picked regardless of ripeness and I put up batches of green tomato chutney and salsa, one last red tomato salsa and a second batch of tomatillo salsa—this time without the cloying artificial lime juice. The peppers, which hadn’t produced much to speak of anyway, I gave up on long ago. I really knew things were coming to a close when the tomatillo finally stated to slow down. Man, those things are productive at their peak! All but a few straggling beans that are taking their dear sweet time drying have been picked and shelled—more on that will be coming, too. So what’s left? There are a few roots in the ground—carrots, beets and turnips. Also, I hope, plugging along out of view are the peanuts, oca and sweet potatoes. It’s at that time of the growing season where the date of the first real frost will make or break their success. As we’re at the equinox, the oca will only just be beginning to form its tubers so I’m set to cover it at a moment’s notice if the forecast is cold. The Brussels sprouts are starting to fill out their mini-cabbagey heads and I’ve picked enough for a little side-dish for two. We’ve got more leeks than we know what to do with. 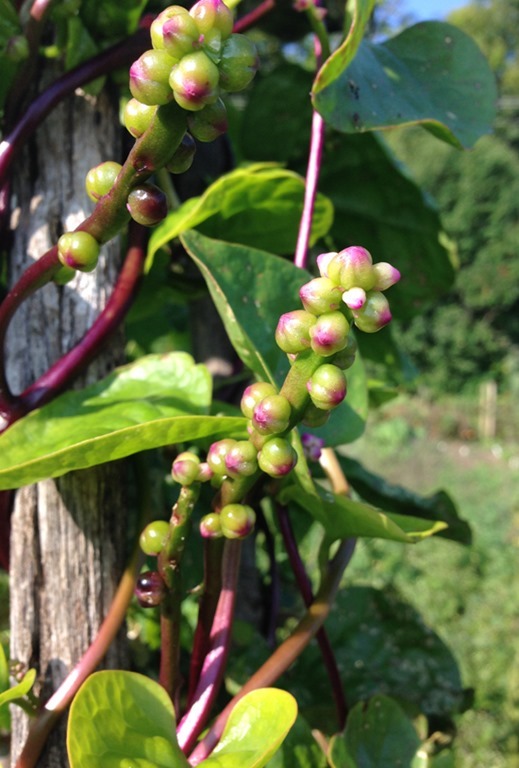 The Malabar spinach is positively rampant, covering its rustic tee-pee. and displaying funky, pink-tipped flower buds. I’ve only eaten it a few time in summer rolls and in a rough approximation of Bachali Kura Pappu with black-eyed peas. I plan to make that again with the proper ingredients now that I’ve finally located an Indian grocery that has curry leaves and the right dal. The list of tasks yet to complete this year is fairly short. Dead tomatoes, peppers and so on have to be hauled to the community compost heap and all the supports stacked. The above-mentioned underground crops will be pulled or dug . There are a couple buckets of good, composted horse manure I’ll bestow on a lucky bed or two. If my tricky arm feels up to it I’d like to dig some more leaf compost into the rest of the beds. At the very least everything but the garlic bed will be covered with a thick mulch of leaves. Around Halloween I’ll plant the garlic and mulch that with straw so the shoots can poke through easily next spring. Then all that’s left is the planning for next year. That and eating all the produce I’ve squirreled away for the winter. Yesterday I decided to make a couple batches of salsa for canning. Never mind the fact that it was hot and humid and that I had just spent the last few hours at a baby shower. The red velvet cupcake was delicious, by the way. No, I had so many ripe tomatoes on the counter and one shelf of the refrigerator devoted to a huge bag of tomatillos so something had to be done. The Co-Conspirator had put in a request for a tomato salsa after my last round of tomato canning. I guess it was feared I’d put up all the tomatoes plain and there wouldn’t be any left for salsa. It’s a legitimate concern since I tend to get going one direction and just keep going. 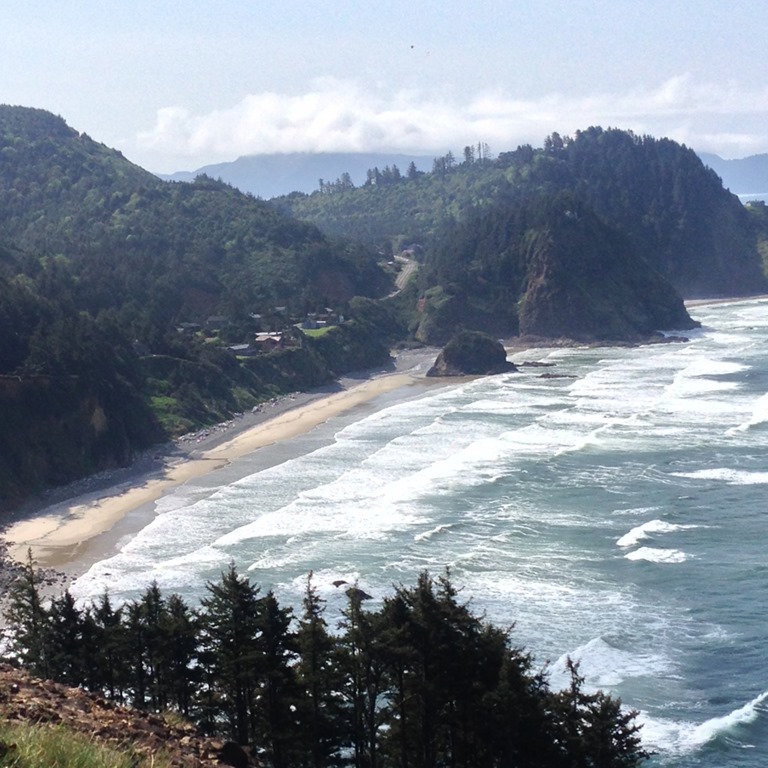 Inertia works both ways with me, just as with the rest of the universe. But I digress. I selected a recipe, Fresh Vegetable Salsa, from Ball’s “Complete Book of Home Preserving,” a more comprehensive canning bible than the classic “Blue Book Guide to Preserving.” After a couple big (for me) sessions of canning tomatoes I’ve gotten pretty good at peeling and cutting up tomatoes so the veg prep went quickly enough. I simmered the salsa per the instructions while I brought the water in the canner up to a boil. I decided while the simmering was happening that I might as well do a batch of tomatillo, too. Getting a canner full of water boiling is an undertaking it seemed sensible to take advantage of an already hot pot. Maybe some day with a little help I can do a real marathon session of different products. For the tomatillo salsa I wanted to use the same recipe I used last year. It was good and we are just finishing up our last jar. Did I make a note of it? Of course not! 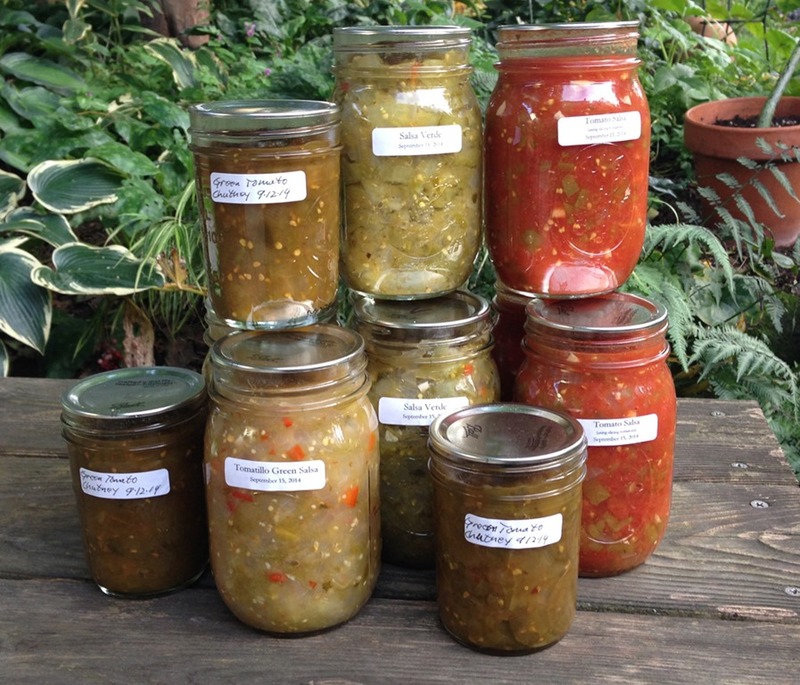 My best guess is that it was the Tomatillo Green Salsa from the Wisconsin Safe Food Preservation Series, which I have the printed booklet versions of in its entirety, thankyouverymuch. I did make two changes to the recipe, something that should be done rarely and carefully with canning recipes. Since our jalapenos are so hot I I used green bell pepper instead of the additional long green chilies and I substituted lime juice for lemon juice. I looked around online and it looks like the bottled stuff is pH adjusted the same as lemon is. Unfortunately, the section of frozen lemon and lime juice that I like has gone entirely missing from our grocery store. I was in a hurry so I grabbed a bottle of ReaLime. That may have been a mistake. When I poured it in the salsa I took a whiff. It smelled more like lime candy than actual limes. I was suckered by the label. It says “100% Lime Juice.” What I missed was the “from concentrate with other added ingredients” under that. I think the lime peel oil they jack it up with may be a bit much. We’ll find out when it’s mellowed in the jar for a while and we taste it. Anyway, the timing worked well enough. While the tomato salsa was processing in the canner I got the tomatillo version simmering. The tomato batch was out of the canner and on the counter with lids popping as I was loading the tomatillo version into the hot water. From beginning to end it took about three hours, including washing all the pots, pans and utensils while the last jars processed. This has been a good summer for canning. 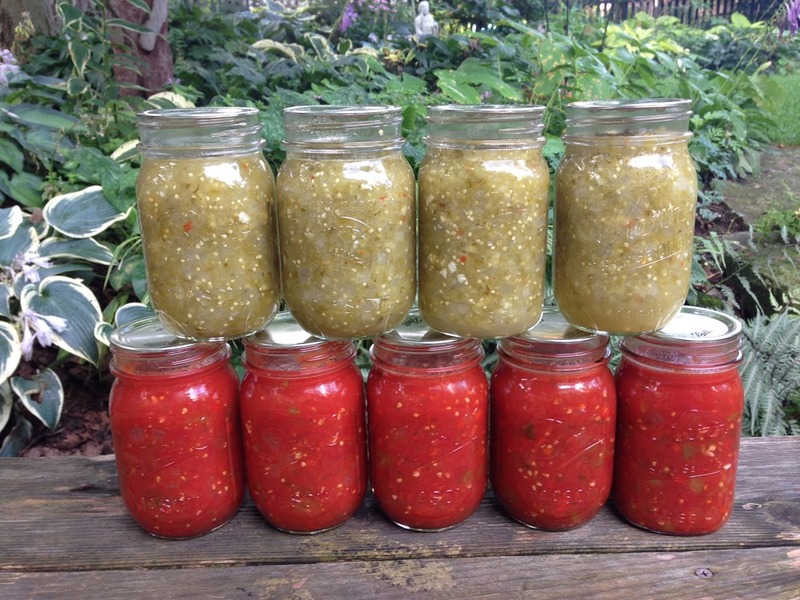 So far I’ve got a batch of our favorite Bread-and-Butter pickles put up, about half the whole tomatoes I’d like to have before winter, and now a couple kinds of salsa. In addition to the additional tomatoes, I want to make the tomatillo salsa again, this time using either just lemon juice or a mix of the good lemon and lime juice if I can find it. We eat a lot of salsa so I may try a different recipe, perhaps one using some of the home-smoked chipotle peppers we’ve get lying around. Now if only the weather would moderate a little from less sauna-like conditions!